Hi, hello! I hope you had a wonderful Christmas. We celebrated ours with my family in Chicago a day early on Monday, then flew back to Minnesota on Christmas Eve in time for Christmas Day with the husband’s family before he shipped off to work the night shift (blech). Meanwhile, I did my wifely duty by holding down the fort at home, wearing my new pajamas, drinking hot cocoa and watching “Friday Night Lights” on Netflix until I passed out at 9 p.m. I think it’s safe to say we all need a week to recover from one holiday before diving into the next — New Year’s Eve. But in case you’ve already got that holiday on the brain, I’m here with a yummy-nummy shrimp cocktail-inspired dip for ya. It’s got cream cheese and shrimpies and tangy cocktail sauce and combined it turns into — well, just about the best thing ever, really. Here’s the thing about me and New Year’s Eve: I’m not a big fan. In fact, it’s kind of my least favorite holiday. I just think I love Christmas so much that New Year’s can’t compare to the hype. Plus, it dictates a lot of getting gussied up and partying and staying up late — all things I enjoy doing from time to time, but generally not all at once anymore because I’m the oldest old woman. So what I’m saying is that my favorite part about New Year’s Eve nowadays is the shrimp cocktail. I’ve decided I’m switching things up this year, however. I’m making this creamy shrimp cocktail dip instead of the usual cocktail-sauce-and-shrimp routine. #watchoutworld But seriously, it’s so good. 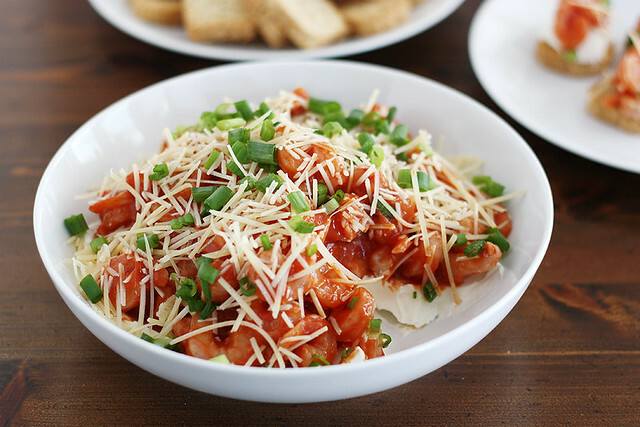 The cream cheese serves as the base, then you toss the shrimp with some ketchup and horseradish, spoon it over the top and sprinkle it with shredded Parmesan cheese and sliced green onions. I suggest serving it with these cute lil’ mini toasts, but crackers and/or your fist also will suffice. In conclusion, bring this dip to a party or chow down couch-side — it’s all good. *Ironically, I actually am going to a party this year. #watchoutworld This dip is still totally happening, though. Spread cream cheese in the bottom of a shallow serving bowl. In a separate medium bowl, toss shrimp with ketchup and horseradish sauce. Add more horseradish sauce to taste, if desired. 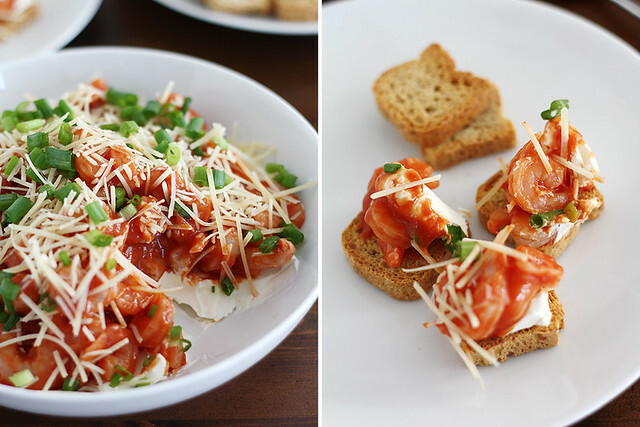 Spoon shrimp mixture evenly over cream cheese. 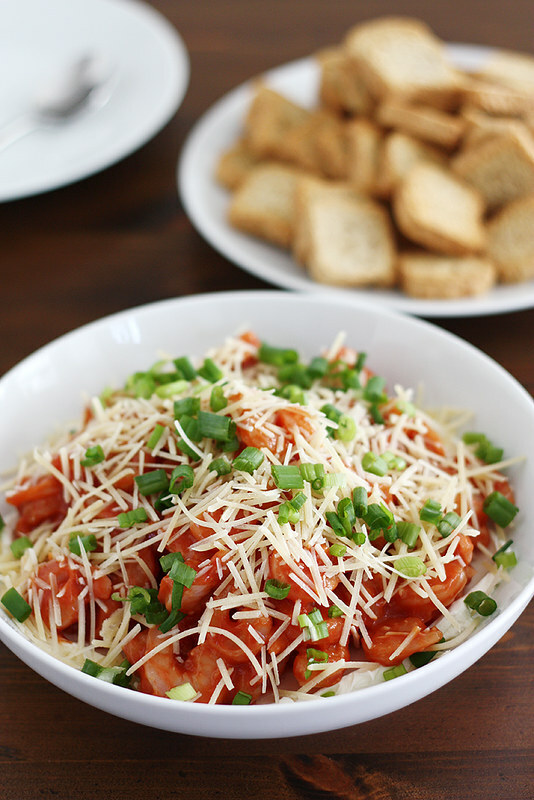 Sprinkle dip with Parmesan cheese and green onions. 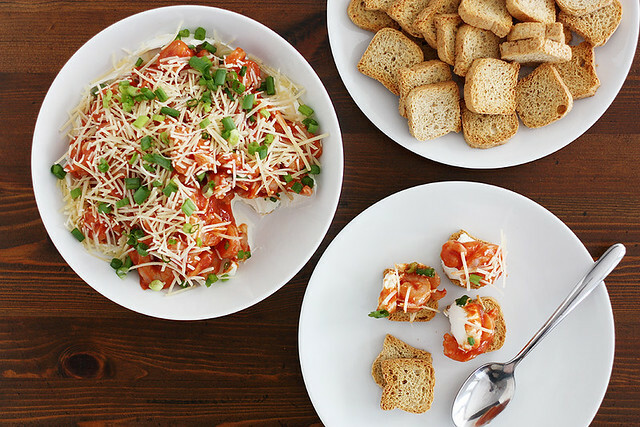 Serve immediately (or cover and chill until ready to serve) with crackers or toasts. I’d never been a fan of New Year’s Eve either, but I’m starting to feel a little bit more excited about it now 😉 Especially if this dip is involved! Oh gosh, I must make it… it looks so so good! Glad you had a good Christmas! Aaaand I literally just finished FNL on Netflix last night. Texas (and Tim Riggins) forever. I’m not big on New Year’s either, but I AM big on this shrimp dip! Looks amazing! You are so right about eh recovery week. I spent Christmas cooking for my family! I definitely need to just sit with crackers and dip for dinner. Not a New Years person either. I cannot remember the last time I stayed up to midnight for it! Love this dip though, I could and would gladly eat half the bowl! ok i’m going to be totally honest with you and tell you that i have never been a shrimp/shrimp cocktail fan, but your writing just makes me so happy. 1) yay for chicago family!!! did you grow up there?? i am originally from the north suburbs! 2) i am glad i’m not the only one who isn’t wild about new years. i’m a big believer in being warm at home in my jammies, watching the people huddle together in times square to see the ball drop. Definitely a winner, Stephanie! I love shrimp dip! Marie — Ahh, it’s SO good! I’m not even into football and I love the show so much. 🙂 Thanks for the dip love! Belinda — Yes. Crackers and dip for dinner for the next week = an excellent plan. 🙂 Thanks, dear! Molly — Yes! I grew up in the northern suburbs, too (as in Grayslake, near Gurnee and Schaumburg and such). And double YES to staying in jammies and watching the ball drop on New Year’s. I am the oldest old woman too! 😉 Love this dip, perfect for a NYE on the couch in pj’s! What a perfect recipe for new years! Julia — True story on the Hulu thing. 🙂 Thanks, girl! Layla — Thanks so much! Erika — Right? Staying up is totally overrated. As long as I have yummy food and my PJs I’m good with whatever happens. 🙂 Thanks, friend! We’re doing a NYE thing this year – AND we have to get dressed up – blech!! I want to stay home in my comfy yoga pants and chow down on this!! Steph, from a non-shrimp lover, you can even make shrimp look good! 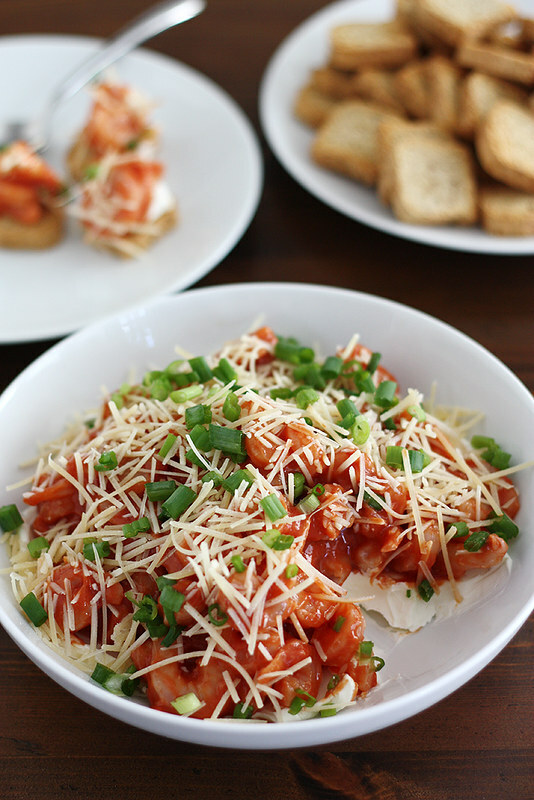 Love the cheesy goodness on this…. I love the idea of the horseradish and those crispy toasts too! Mmm. Happy new year!